We Live In A Political World: #357 / What Do You Expect? #357 / What Do You Expect? The picture above, from The Nation, shows ﻿President-elect Donald Trump introducing retired Marine Corps general James Mattis as his appointed Secretary of Defense during a rally in Fayetteville, North Carolina. This rally took place on December 6, 2016. The photo is by Gerry Broome. 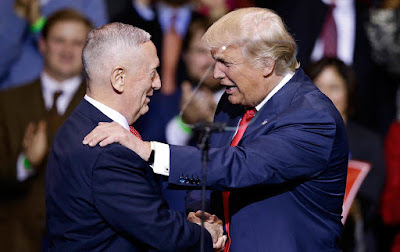 The article from which I took the photo is titled, "﻿Trump’s Cabinet Is a Coup Waiting to Happen: The president-elect’s main advisors are a clique of 'warrior-generals' who may spell the end of the democratic experiment." I want to raise a concern about this article, and about articles with a similar message, which have proliferated since the presidential election on November 8th. The "message" I am talking about is a prediction that when Donald Trump becomes President we will, likely, lose our democracy and succumb to a totalitarian politics. This is not impossible, of course, and we are absolutely right to be concerned. We certainly can't "normalize" the kind of statements that the president-elect has been making. What people "say," and what they "do," of course, are different, and the real test comes when our newly-elected President begins to "do" things. If Trump, as President, ignores the law, the courts, and the Constitution, he will have actually "done" something wrong. At such time, if those working for the federal government (in federal agencies and in the military) carry out what amount to illegitimate and unconstitutional orders, THEN we have a real problem! We particularly have a problem if the institutions that are supposed to be separate and independent, and that are supposed to "check and balance" exactly that kind of abuse of position, capitulate and ratify such illegal and unconstitutional behavior. I say abuse of "position" advisedly. Abuse of "power" only occurs when abusive orders are given, and are then followed. The "power" of the abuser comes from the actions of those who carry out illegal and unconstitutional orders. I am concerned that possible abuses of position do not mature into abuses of power. They only will if those ordered to do illegal and unconstitutional things actually do them. President-elect Trump, for instance, has said that he thinks torture is a useful tool, and that he'll implement tortures "far worse" than waterboarding. Well, unless the President is going to subdue the subject and pour the water himself, he will be able to carry out that illegal activity only if someone does the dirty work for him. Here is my concern: articles like the one linked here convey the thought that we should "expect" this kind of behavior, and that we should "expect" people to carry out illegal and unconstitutional orders. When and if this occurs, you could properly call it a "coup," and articles like this article in The Nation indicate that we should expect this to happen. I think we need to resist such thinking. Many people (probably most people) think of themselves as "observers" of politics. This "observer perspective" makes such an observer believe that what he or she "observes" is, in fact, a kind of reality that is inevitable. But nothing that happens in politics is "inevitable." We are not only able to "observe" (each one of us); we are able to "act." I believe we should not give the courts, or our elected representatives in Congress, or agency employees, or members of the Armed Forces ANY sense that we actually "expect" them to capitulate to undemocratic and totalitarian orders from the President, or from officials in the Trump Administration. To the degree that we seem to "expect" such compliance, our expectations will help let such people "off the hook," because their capitulation will have been "expected in advance," and thus, in terms of how human beings actually act, be "ratified because expected." It is my belief that people quite often (most often, actually) act as they believe they are "expected to." Therefore, it is critical that we expect our courts to act as a check on unconstitutional abuse, and that we expect federal agency employees, and our military, to refuse illegal and unconstitutional orders. Most importantly, it is critically important that we expect our elected representatives (ALL of them, not just Democratic Party elected officials) to carry out their Constitutional duties to serve as a check and balance on outrageous claims of executive prerogative. If we "expect a coup," we make it more likely. And, we make it harder to oppose. Caution about what lies ahead is more than justified. But let us not telegraph to those who will be asked to carry out illegal and unconstitutional actions that we actually "expect" them to do so. If we indicate that such is, indeed, what we "expect," we will give, in advance, a kind of approval for the horrors we must, all of us, now determine that we will resist. We must determine that we will resist such orders, if they come, to the full extent of our "lives, our fortunes, and our sacred honor." If we expect less, of ourselves and of all our fellow citizens, a totalitarian reality is, indeed, what awaits our country.